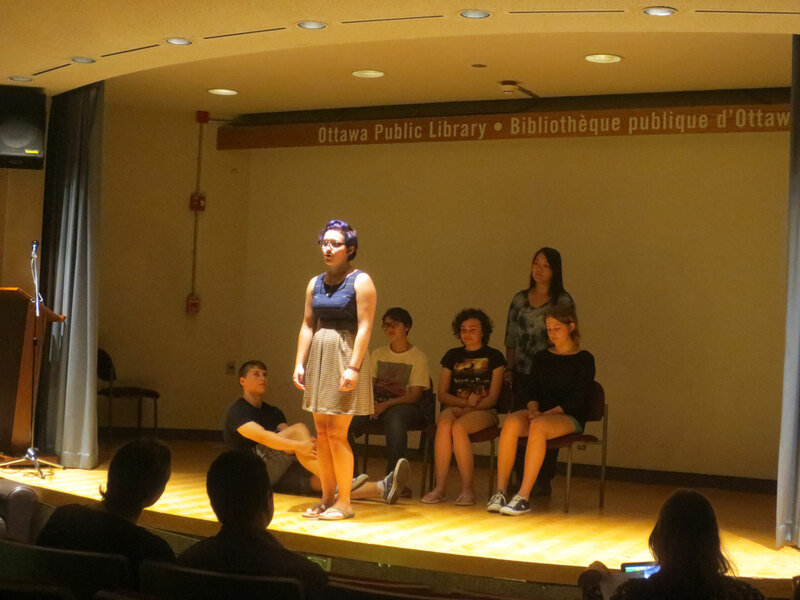 We are thrilled to have launched The Creative Well Theatre Project in Ottawa in the fall of 2015. 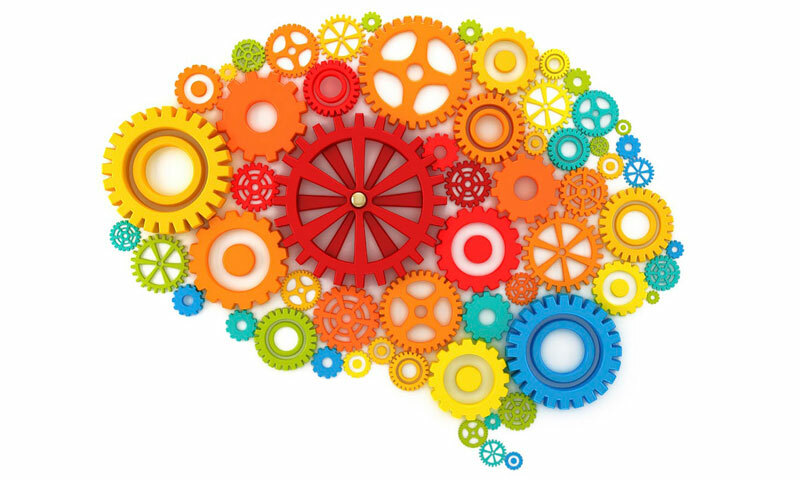 The Creative Well Theatre Project, facilitated by Naomi Tessler in collaboration with Megan Piercey Monafu, seeks to creatively address social stigma attached to mental illness. Our project offer adults struggling with mental illness a chance to participate in weekly intensive arts programming, gain new theatre skills and access creative outlets to express their stories and build community through working together as a theatre ensemble. Each year, the culmination of this project is the co-creation and touring of a forum theatre play that will act as a tool to express and speak out against the ensemble’s struggles within the mental health system and address stigmatization from the wider Ottawa community. We are deeply grateful for the generous funding support of the Community Foundation of Ottawa, the Ontario Arts Council and the support of our community partners: Psychiatric Survivors of Ottawa, Salus Ottawa and Centretown Community Health Centre. Participants have shared that from the program, they’re taking away things like: “confidence, community, play, courage, support…” and letting go of “fear, inhibitions, judgment, negativity, self-doubt…”.See our video from our play The Waiting Room created in 2015/2016- the first year of the project here. We our thrilled to be working in partnership with HEART-Health and Equity through Advocacy, Research, and Theatre, an organization founded by McMaster Medical Students at the Niagara campus. HEART conducts research about issues of oppression within the healthcare system and invites Branch Out Theatre to transform their research into ethnodrama legislative theatre plays to motivate audiences impacted by the issues, and those studying and practicing in the healthcare field, to create systemic change. Gerbils, written and directed by Naomi Tessler in 2016, was the first play created as part of the HEART/Branch Out Theatre collaboration. Gerbils is based on HEART’s research on homelessness and access to healthcare in the Niagara Region. The play is an ethnodrama legislative theatre play which weaves together 16 transcripts and has captured all the voices of the interviewees. Gerbils was performed three times in St. Catherines in 2016 for three different audiences: the Niagara homeless community, McMaster medical students and physicians who were joined by local politicians, health policymakers and housing advocates in the Niagara region. The play was deeply meaningful and phenomenally received by each audience group. Gerbils moved many audience members to share their own stories on and offstage and challenged healthcare practitioners to critically reflect on the changes needed within their system. 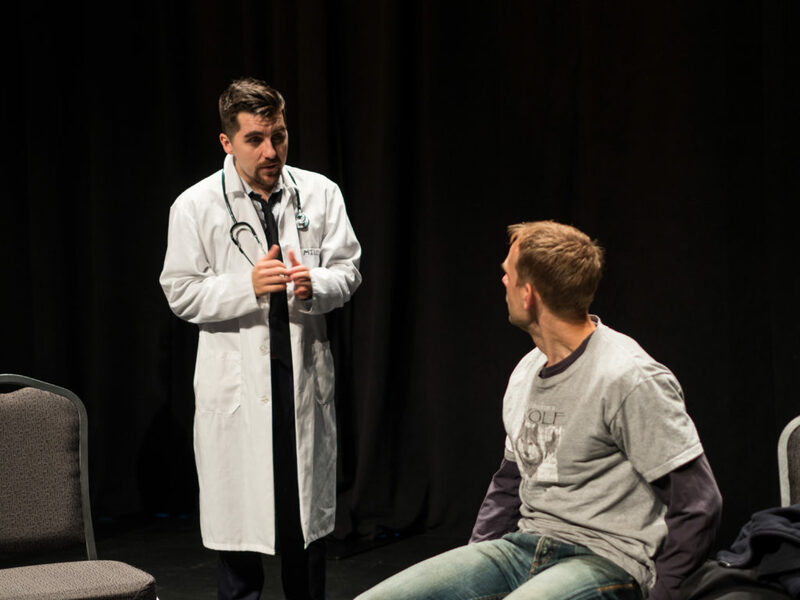 The forums brought many audience members onstage as spect-actors to rehearse interventions, and demonstrated the importance of simple changes in body language and listening skills to make street-involved patients feel more at ease, welcomed and supported. Following each performance, the legislative theatre process invited audience members to propose and co-create policies based on the interventions they witnessed by spect-actors in the play. The interventions and policies from all the audience members has further informed HEART’s research and our collective hope is that local policy makers actually put the policies that were created at all three shows into practice. HEART is conducting ongoing advocacy work in the Niagara region with the politicians and policymakers who attended the performances to ensure that the message of Gerbils is not forgotten and the cycle of oppression can be changed. Check out the local news coverage taken at our performance of Gerbils for physicians in the Niagara region HERE. We look so forward to creating new plays based on HEART’s research and supporting the vision for systemic change in healthcare in Ontario. Branch Out Theatre is proud to partner with The Canadian Centre for Gender & Sexual Diversity (CCGSD) an inspiring and proactive national organization that works to eliminate bullying, homophobia, transphobia, and other forms of discrimination in schools and youth communities. Since March 2015, we have collaborated with CCGSD to lead a March Break Theatre Camp and an ongoing after school program for LGBTQ & Allied youth ages 13-24; inviting participants to use popular theatre games and techniques to build skills in social advocacy, conflict resolution, storytelling, improvisation and play creation. Through the Stand Up, Speak Out Theatre Project, participants have the chance to build a network of support, share their personal stories and have their voices heard. As a culmination to the march break camps and each season of our after school program, participants create and perform forum theatre plays that motivate our audiences to join us in Standing Up and Speaking Out about bullying, homophobia and transphobia. This partnership has been funded through Community Foundation of Ottawa, The Ontario Arts Council and The City of Ottawa. Check out the video of our Stand Up, Speak Out Theatre Project Here. Since 2013, Branch Out Theatre has been working in partnership with Youth Without Shelter as the Artistic Coordinator for Tokens4Change-an incredible youth-based project that raises awareness about youth homelessness through the arts in effort to raise money for Youth Without Shelter, an emergency shelter in Etobicoke. Tokens 4 Change is focused on youth acting for youth. Branch Out Theatre‘s role in this initiative is to facilitate a popular theatre workshop called Resiliency, Arts and Activism in schools across Toronto that motivates students to use the arts to support homeless youth. We then support artists of various genres in working with these students to create art projects that serve to raise awareness about youth homelessness in Toronto that will be displayed and performed as part of Tokens 4 Change‘s big event, which takes place the first Friday of February every year, in PATH Locations and subway stations across the city. We are delighted to be working with another fantastic group of artists this year to help students creatively and passionately animate Tokens4Change on February 3rd, 2017! For all arts projects and performances, please check for regular updates on theTokens4Change schedule here. We hope you’ll come out and show your support for Tokens4Change this February! 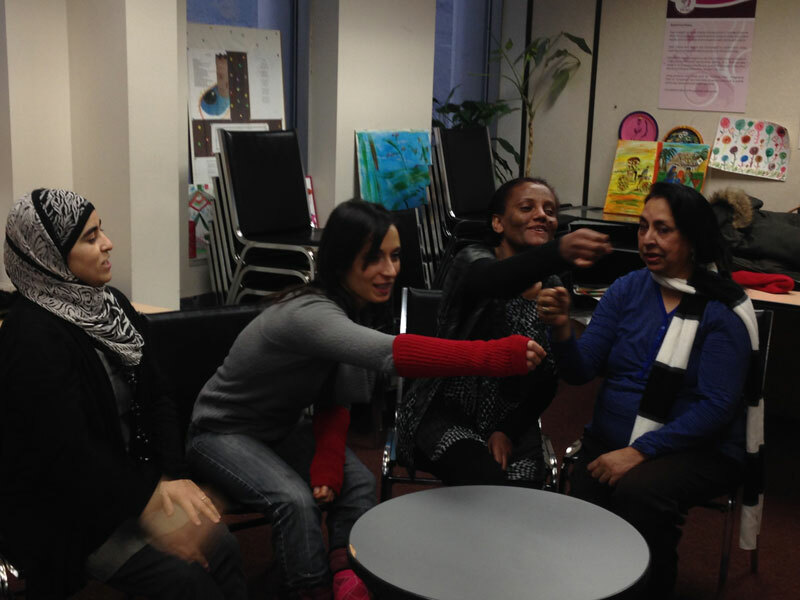 From The Roots Theatre Project is an ongoing partnership with with Immigrant Women Services Ottawa. Our first project took place from November 2014-February, 2015 as part of AOE Art’s Council’s Art Place Artist in Residency program, in which we worked with immigrant women in Ottawa, running weekly sessions to encourage participants to creatively express themselves, share their stories as new Canadians- the joys and the challenges, build community, and learn new theatre and storytelling skills. Together we co-created a forum theatre play called New Country. New Conflicts. addressing the discrimination and isolation participants have experienced since moving to Canada. Our performance has been shared with audiences of immigrant women, social service staff members and at public events in Ottawa since February 2015 and continues to provide a powerful opportunity to engage audiences to intervene in the action of our play to rehearse how to address the issues of discrimination and isolation common to our participants’ experiences in Canada. In January 2017, in celebration of Canada’s 150th and for our seconds time as part of AOE Art’s Council’s Art Place Artist in Residence Program, From the Roots Theatre Project will build off of our 2014/2015 project and serve to engage immigrant women and girls in building leadership, communication and theatre skills and culminating in the co-creation of a new forum theatre play that seeks community support in addressing and transforming the intergenerational conflicts common to immigrant women and girls in Ottawa. Participants will also learn how to build and facilitate their own theatre and storytelling workshop with youth and have the opportunity to co-facilitate workshops for newcomer girls focusing on stories of intergenerational conflicts. These workshops will serve to inform the content of the forum theatre play created for the project and help to build our audience for a summer tour of our play. Check out an article about the project written for AOE Art Council’s Arts Accolade HERE.